In true Nigella style, instead of sticking firmly to the recipe, I modified it to use what I had, something she strongly encourages in her cookbooks. I also lightened it up a bit, giving it a mini-makeover. 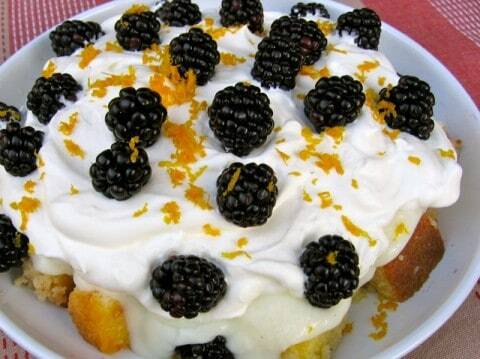 Nigella originally concocted her orange blackberry trifle to use up her leftover marmalade pudding cake, a recipe that is on my list to try. I instantly thought it would be a great way to use up what remained of my light yogurt pound cake. Make the pudding first since it needs a chance to cool before being added to the trifle. In a small bowl, mix the sugar, cornstarch, and salt with ½ cup of evaporated milk. Put the remaining ½ cup evaporated milk and 1 cup 2% milk in a heavy bottomed saucepan set over medium low heat. Heat until it begins to steam and then slowly whisk in the cornstach mixture, stirring constantly. Cook over medium low heat until the pudding thickens and just starts to boil, about 5 minutes. Reduce the heat to very low and continue to cook, stirring often, another 5 minutes or so. Remove from the heat and stir in the vanilla. Cover and chill before using it in the trifle. Spread the slices of pound cake with orange marmalade and then cut them into 1-inch cubes. Place the cut cake cubes in a shallow bowl and Drizzle them with the orange liqueur and orange juice. Toss them a bit to get some of the liquor and juice on each piece. 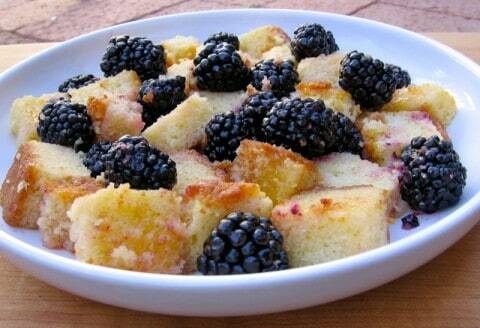 Toss in 1 cup of the blackberries. Cover the cake and berries evenly with the cooled pudding and then spoon over the whipped cream. Cover and refrigerate at least 2 hours. 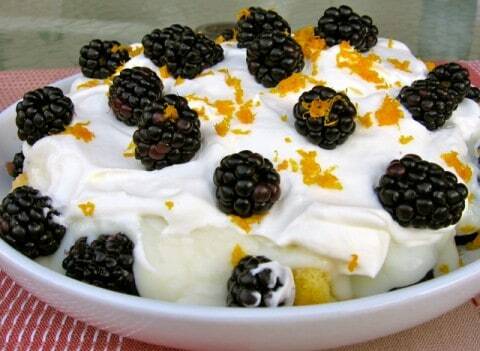 When you are ready to serve, scatter the remaing blackberries and orange zest over the top.